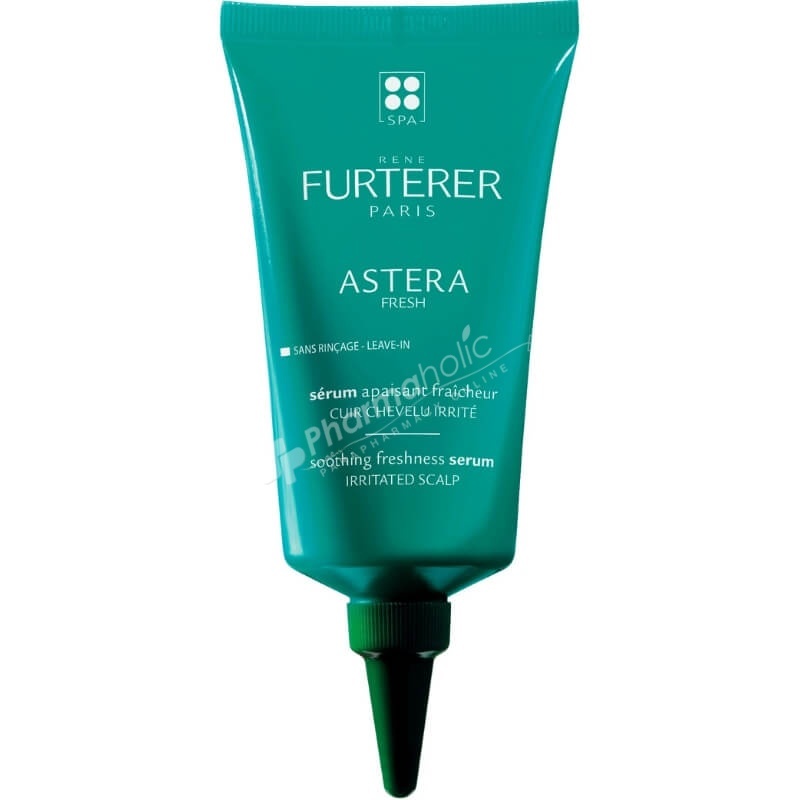 Rene Furterer Astera Fresh, Soothing Freshness Serum protects the scalp from further irritation. Once or twice a week, apply to a clean damp scalp section by section. Do not rinse. WATER , ALCOHOL , GLYCERIN , HYDROXYETHYL ACRYLATE/SODIUM ACRYLOYLDIMETHYL TAURATE COPOLYMER , ETHYLHEXYL PALMITATE , GLYCINE, BHT , BLUE 1 , CITRIC ACID , ECHINACEA ANGUSTIFOLIA ROOT EXTRACT, EUCALYPTUS GLOBULUS LEAF OIL , GLYCINE SOJA (SOYBEAN) OIL , GLYCINE SOJA (SOYBEAN) STEROLS , GLYCOLIPIDS , GREEN 5 , ISOHEXADECANE , LINOLEIC ACID , LINOLENIC ACID, MENTHA VIRIDIS (SPEARMINT) LEAF OIL , MENTHOL , NIACINAMIDE , OLEIC ACID, PANTHENOL , PANTOLACTONE , PHOSPHOLIPIDS , POLYSORBATE 60 , POTASSIUM SORBATE , SODIUM BENZOATE , SODIUM HYDROXIDE, SORBITAN ISOSTEARATE , TOCOPHERYL ACETATE. Avoid use for 2 days before and 2 days after in-salon chemical services. Avoid contact with eyes. For adult and adolescent use only.